We all know that I am a skincare fanatic and I am meticulous about my routine - trying to keep the signs of aging at bay and for my skin to look as good as it possibly can. In the past few weeks, I have had more compliments on my skin than ever before - people are telling me that I look younger (my husband says 20 years younger but I think that's a bit of an exaggeration and he's been kissing the Blarney Stone!). Needless to say, I am delighted with the compliments because I know that I analyse my skin for changes but for others to see a noticeable change means that I must be doing something right! I will be doing a post all about my current skincare routine soon but the two staple moisturisers I have been using for 6 weeks are these Clarins Day and Night Creams. Now I know that 'Extra-Firming' in the name may lead you to believe that these are aimed at those in their 50s/60s but I personally don't think that they are exclusive to that age group. Anybody who is seeing any slackening in their skin will benefit from these creams. The slackening may be due to age but sun damage, weight gain and loss and illness can all cause it too. The key ingredient in the Extra-Firming Day Cream is mitracarpus, which stimulates the production of collagen and increases the elasticity of the skin. It also contains kangaroo flower, native to - you've guessed it - Australia! Their researchers found that this encourages cell regeneration and the combination of these ingredients alongside hyaluronic acid and a host of others, increases cell turnover whilst producing collagen and the result is nourished, plump and firm skin. Although the texture is quite rich, it absorbs into the skin quickly without leaving any residue, yet my skin feels nourished all day. As a result, my fine lines and nasal labial lines are less visible. I also find that my jaw contours are more streamlined. My skin looks fresh and feels supple and my makeup applies very evenly over it. This moisturiser is worth its weight in gold for anyone concerned with the signs of aging. Our skin regenerates at night and the peak hours are between 11pm and 2am, so what we put on our skin at night is very important as we want to encourage the cell regeneration. The key ingredient in the Extra-Firming Night Cream is moonstone hydrated silica, which combined with the afore-mentioned kangaroo flower, encourages skin regeneration, which in turns increases the elasticity of the skin. My skin is bouncy in the mornings since I began using this cream, which for someone with dry skin, is no mean feat! The combination of both creams means that my skin is looking fresher and more youthful than it has done in quite a while. We've all seen eye masks before but the new Hydra-Essential Moisturizing Reviving Eye Mask is different as it isn't a sheet-type mask. Instead, it is like a traditional face mask. It applies like a cream but with the cooling and soothing feeling that you get from a gel so it reduces puffiness but also hydrates the eye area. It contains Irish Moss Extract to soothe the eye area (brilliant if you suffer from itchy eyes as this really does calm and soothe the skin around the eyes) and quinoa, which replenishes moisture in the area. It can be used as a quick fix by applying for 10 minutes or as an overnight mask, which I personally favour as I find the cooling effect very relaxing and I like to wake to a plump eye area. The new Hydra-Essential Moisture Replenishing Lip Balm is an intensely nourishing balm that drenches the lips in moisture. Its key ingredients are Blue Lotus Wax and Cocoa Extract leave the skin feeling smooth and soft - it feels more like a lip mask to a balm, to me but that's a good thing as it's the perfect overnight treatment. Overall, all four products are ticking all of my boxes and I couldn't be happier to have them in my routine! Now on to the amazing gift with purchase (worth £54) that is available in selected branches of House Of Fraser until April 14th with the purchase of two or more products, one to be skincare. 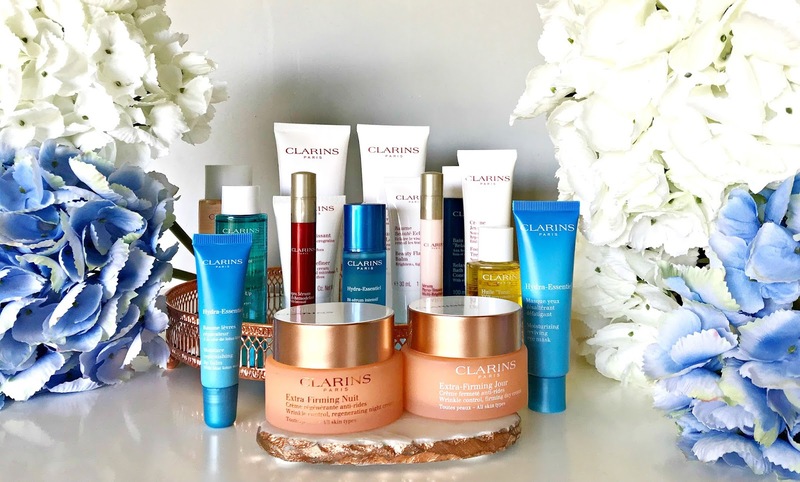 As you may know, Clarins are very generous with their sample sizes so I am excited to share what's available with you! There are 12 products to choose from and you can choose four with your purchase. All are 100ml and under, making them perfect for travelling, yet generous enough for you to use long enough to really test and decide if you want to buy the full size. I think you'll agree that this is an amazing gift with purchase and a real incentive to buy some Clarins products that may have been on your list for a while. The House of Fraser stores that this GWP is available in are: Guildford, Glasgow, Oxford Street, Edinburgh, Manchester, Richmond, Cheltenham, Birmingham, Bath and London City. You can choose 4 products (worth £54) with the purchase of two or more Clarins products, one of which must be skincare, until April 14th. Are you tempted? I'd love to hear what your favourite Clarins product is?